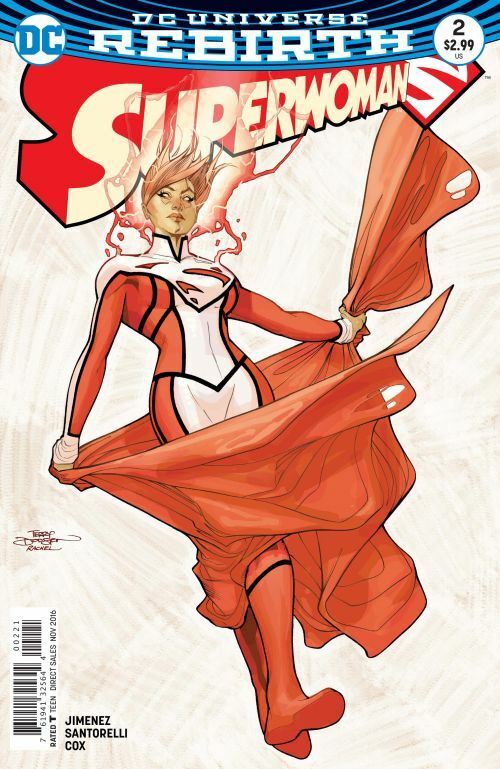 Phil Jimenez actually manages to top the first issue with Superwoman #2. That’s quite a feat, considering what a thrill ride the debut was. With issue 2, Lana Lang is unquestionably Superwoman, whether she wants to be or not. And though she is a reluctant hero, she proves herself a true one, not listening to all the sensible reasons she should stay out of the fray, and risking her life for the benefit of the many. Once again, we have an issue with a lot of good twists and surprises, none of which I want to ruin, so I will avoid talking about a number of things. Because Lana is the central character, the story brings back her boyfriend, Steel, and we get to catch up with his niece, Natasha Irons, as well. Lex Luthor, still trying to play the hero, is very important in the issue, as is Mercy Graves, his bodyguard, looking quite different than she used to. I will admit, one part of the story did confuse me, even on second reading. Perhaps someone who might be, or look like, the Prankster is involved in the story? I’m just not sure. But there are other villains whose roles are much clearer, including the Atomic Skull. There is an evil super-powered woman, whose face and skin look like a Bizarro, while her costume resembles that of the evil Super Woman from the Crime Syndicate. And the revelation of who is behind her creation makes for a great cliffhanger. Jimenez likes to make allusions to old characters and elements from the Superman mythos, and I really enjoy that. Reference is made both to Insect Queen, and to Lena Luthor, Lex’s sister. But the moment that really stuck in my mind was a great personal detail. Lana is uncertain of who is real, and who might be an illusion or a clone at one point in this issue. When Steel comes to help her, she demands that he tell her something that only he would know. And so we find out that Lana likes watching John Henry Irons playing bongo drums when he is naked. It’s so intimate, and so absurd, that it feels completely real.